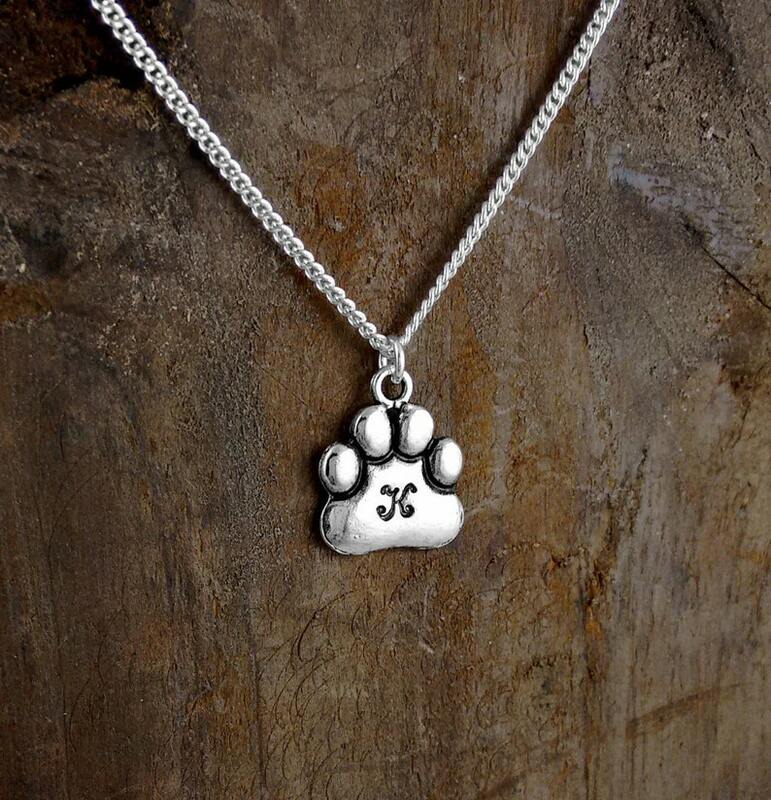 Free shipping to United States when you buy 3 items from IloveMyDogJewelry. See item details below for sale terms. 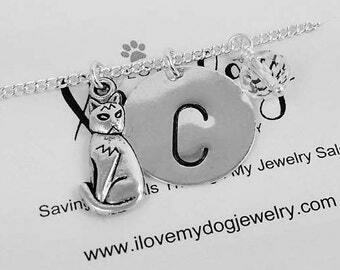 I Love My Dog Jewelry® » Made with love » Be part of a good cause » With each sale, a contribution is made to a charity. Whether you are shopping for yourself or buying a gift for an animal lover, you'll find what you're looking for here! Small things add up. Small things make bigger things. Small things create ripples. You don’t need to do something huge to make a positive difference in the world. 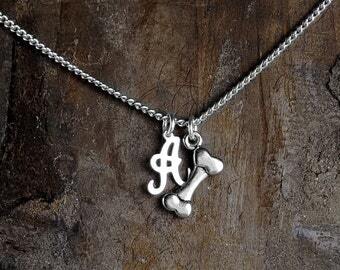 Great for a pet lover, for a pet memorial gift, or for a new fur baby to the family! 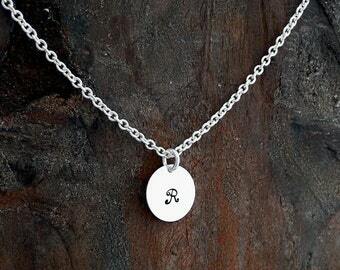 Can be layered with other necklaces or worn alone for a minimalist look. So many people will ask, "...where did you find this?" be sure to let me know what color you prefer. Just leave a message in the notes to confirm that you would like gift wrapping service. Please note: A sample necklace is being used in these photos. The necklace you receive will, of course, be completely brand new, and have never been worn. Each item is handmade and may vary slightly. To reduce waste, multiple items may be wrapped together. If you would like items individually wrapped, please leave a note in Message to Seller during check-out. "I create stylish jewelry that I personally wear every day." I love to create jewelry that is very simple, delicate and feminine. My designs strike a perfect balance between professional, creative, formal and comfortable. 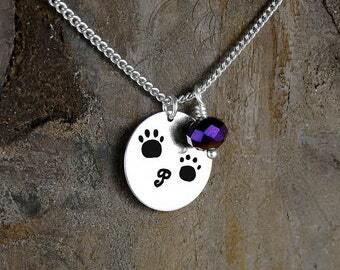 Handmade for you, by me, Robyn, at I Love My Dog Jewelry. Okay, so you need a gift? I'm here to help. I would like to help make gift giving a little easier on you, and it’s always a good time to treat yourself. I'm happy to ship to another address! Just send me a note at checkout that can be included with your purchase instead of a receipt so that they know its from you! Let me know if you would like it gift wrapped as well. Love this design, but need different colors or stones? I can accommodate most custom orders! Just send me a message and I will set up a custom listing for you. So many styles and looks to choose from. Most of my jewelry can be customized; if you see something you like but want some changes made, just ask and I'll do my best to accommodate you. If you don't see what you're looking for, please send me a message on Etsy or email me at robynkearns68 [!at]gmail.com . I would be more than happy to work with you. Feel good knowing that someone besides you benefits from your jewelry purchase... Look great and make a difference. Jewelry that you will wear today, tomorrow and next year. I create classic pieces for women to wear every day. Jewelry that has personal meaning to me and isn't just a fad or trend. 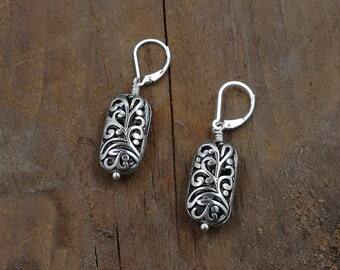 Feel great about what you are wearing while sending some good karma out into the world. My jewelry has a purpose beyond the creation of beautiful adornments. I believe in the power of gratitude and giving and I love creating for the benefit of animals. I am a volunteer rescue worker. I work with some very wonderful groups that drive rescue pets to their new homes. Like you, I love animals. Like you, I want to help animals. My jewelry sales improve the lives of homeless and abused animals through sheltering, adoption, education and advocacy, as well as the prevention of animal cruelty. Always remember when you are wearing my beautiful jewelry you are helping a beautiful creature. You can feel good knowing that someone besides you benefits from your purchase... Look great and make a difference. Beautiful and Thoughtful Gifts for Women. Styles include: Bangle Charm Bracelets, Earrings and Necklaces. Look great while doing good. Stylish Jewelry For A Good Cause. 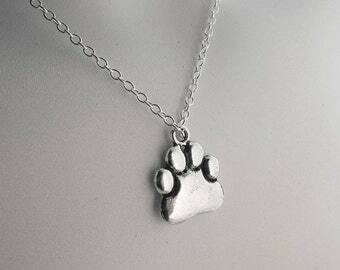 THANK YOU to everyone who has included I Love My Dog Jewelry in their Etsy Treasuries, Blogs and websites! I really appreciate it! If you copy and paste any of these URL's they will take you right to the site. You're sure to find the perfect gift for someone you love (or yourself). As with all handmade items, my items are delicate, so please treat with care. To prolong the life of your piece, please avoid contact with heavy perfumes. Like all jewelry, your jewelry should be handled carefully. Never subject to chlorine, silver dips, chemical solutions or ultrasonic cleaners, as these substances can cause the natural gemstones and metals to discolor. ALWAYS REMOVE all jewelry before showering, swimming, exercising. Always store in a dry airtight bag when not wearing. As with all silver and brass, it WILL form a patina/darken over time, easily brighten sterling silver with a silver polishing cloth (clean VERY gently), and brass pieces with brass cleaner. GIFT GIVING, I would love to include a card with a personal message. Please be sure to indicate what color gift wrap you would like. SUMMER LOVE - FREE SHIPPING when you buy 3 or more items. A perfect time to add to your summer jewelry collection. gift for a December birthday girl - she loves it! I accept Paypal and credit cards. When you submit an order, payment is expected at the time you place your order. 8% Sales tax if you live in New York state. All jewelry is guaranteed and refunds/exchanges are determined on a case by case basis. All sales are final. If you have an issue with your purchase, please contact me within 3 days of receiving your purchase so an agreement can be reached. Thank you. Your satisfaction is my #1 priority. I want you to love your new jewelry. If you are not happy with your purchase for ANY reason please let me know first. Thank you. I ship all US orders via USPS 1st Class. All orders come with tracking number. All items ship within 3-5 business days of receiving payment, usually sooner! INSURANCE OPTION: I am not responsible for packages after they leave the Post Office. If you would like to pay to have your package insured, please contact me before making your purchase. Please let me know if you need a rush delivery prior to placing your order for more shipping options. All International orders are shipped via USPS First Class International Mail. Insurance is NOT available with this option, Certificate of Mailing is available with this option. Please note: International mail can take anywhere from 3 days (rare) to 5 or 6 WEEKS or longer to arrive! Please be aware of this when you place your order. For international buyers, please know that once the item leaves my shop I'm not responsible for any fees related to duty, customs this is your responsibility. Items can not be returned for that issue or because the item didn't arrive on time. I don't have control over post offices or deliveries. Please let me know if you would like to purchase Certificate of Mailing for tracking reference for your package. I highly recommend this, in case that a package is lost during transit. The post office won't take any responsibility is something is lost. I am not responsible for lost packages. I ship items out within 1-5 business days after receiving payment (not including weekends and Holidays). I will only ship the item/items you have purchased to the address you have written in PayPal. All purchases will ship via USPS First Class. Delivery Confirmation is added to every U.S. Shipment. You can access the tracking # through your shipment notification email. I am not responsible for lost or damaged orders. All purchases will ship via USPS First Class International Mail. Please be aware that while it usually takes 1-2 weeks for your order to arrive, it could take up to six weeks or longer as shipping times are only estimates and not guaranteed. I am not responsible for any duty/customs charges, this is the buyers responsibility. I am also not responsible for lost or damaged orders. U.S. PRIORITY SHIPPING: 2-3 Business Days for most locations. U.S. EXPRESS SHIPPING: 1-2 Business Days for most locations. I am not responsible for packages after they leave the Post Office. If you would like to pay to have your package insured, (U.S orders only) please contact before making your purchase. VERY IMPORTANT: Please make sure your Etsy address is correct, I will be using this address for shipping! I love to create custom orders as well. Please send an email and we can discuss exactly what you need. As with all handmade items, my items are delicate, so please treat with care. To prolong the life of your piece, please avoid contact with water or heavy perfumes. Like all fine jewelry, your jewelry should be handled carefully. Clean gently with a silver polishing cloth when necessary, but never subject to chlorine, silver dips, chemical solutions or ultrasonic cleaners, as these substances can cause the natural gemstones to discolor. I don't recommend wearing in the shower or swimming pool.